TOKYO (AP) — Revised estimates of the potential impact from an earthquake off Japan's southern coast show much of the country's Pacific shore could be inundated by a tsunami more than 34 meters (112 feet) high. 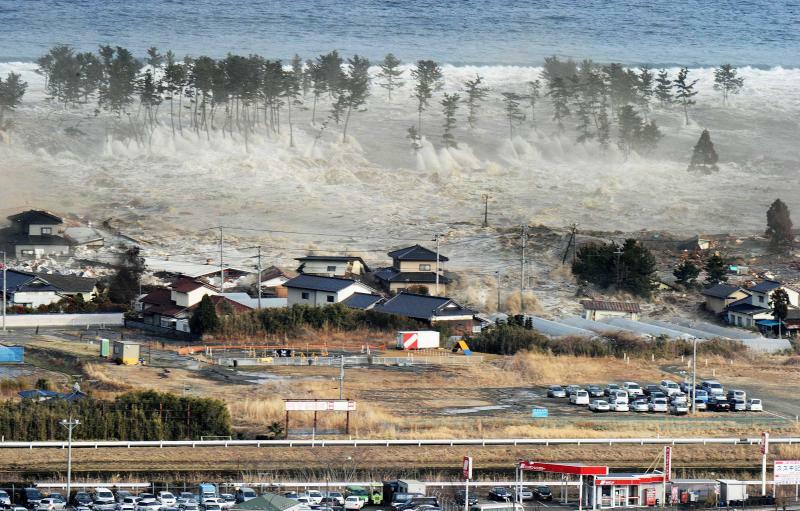 A government-commissioned panel of experts says a tsunami unleashed by a magnitude-9.0 earthquake in the Nankai trough, which runs east of Japan's main island of Honshu to the southern island of Kyushu, could top 34 meters. An earlier forecast in 2003 put the potential maximum height of such a tsunami at less than 20 meters (66 feet). The revisions, posted on a government website, are based on new research following last March's magnitude-9.0 earthquake and tsunami, which devastated a long stretch of Japan's northeastern coast and killed about 19,000 people. Last year's catastrophe, and the ensuing crisis at the Fukushima Dai-ichi nuclear power plant, has prompted sweeping reviews of Japan's disaster preparedness, and criticism over apparent failures to take into account potential risks. The tsunami knocked out power at the 40-year-old coastal nuclear plant, leading to the worst nuclear disaster since Chernobyl in 1986. Tens of thousands of residents have had to leave the area, and it's unclear whether some will ever be able to move back. The Fukushima plant was designed to withstand a 6-meter (20-foot) tsunami. The actual surge was 14 meters (45 feet) high. In other unsettling news, another government report shows that a strong earthquake hitting the Tokyo Bay region could shake the Tokyo-Yokohama metropolitan area — home to more than 33 million people — at the maximum seismic intensity of 7 on the Japanese scale. The report, issued Friday by the Ministry of Education, came in the form of mapping that shows that much of the Tokyo region would likely experience severe shaking from a magnitude-7.3 earthquake inside Tokyo Bay. The study prompted calls for Tokyoites to be better prepared for such disasters. Although they live with the constant threat of a major earthquake that experts have long said is overdue for the region, not all living in the region keep recommended water and other supplies on hand. A report in the newspaper Asahi Shimbun listed troubles that might be expected from a major quake, such as electricity outages that could persist for more than a week and water supply disruptions that could last for nearly a month, based on government estimates. The revised tsunami forecast for a possible Nankai earthquake says Tokyo could expect waves up to 2.3 meters (7.6 feet) high. But at the coastal town of Kuroshio, on the island of Shikoku, the tsunami could top 34 meters (112 feet), it shows. The computer modeling for the revised forecasts assumes a high tide for the highest estimates.